If this isn’t feasible, you can simply place a block under one edge of the drum. When doing this, ensure that the bungs are at the 3 and 9 o’clock positions. This allows most of the water to drain off the drum and not be pulled in during the process mentioned above. Drum covers can also be purchased to keep water from standing around the drum openings. Another possible solution is to consider the use of modular containers designed for outdoor storage. 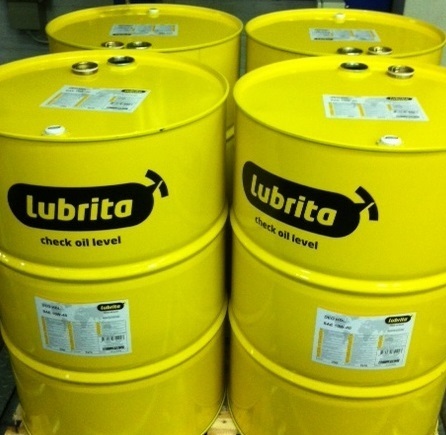 Several types of these containers are available and can be used to protect your lubricants. Keep in mind that when containers are stored outside, the first-in/first-out method should be followed rigorously. Also, be sure to store the minimum possible quantities necessary. This will reduce the risk of product degradation and contamination. Although often overlooked, how you store drums of oil can have a major effect on the life of the lubricant before it is even put into use. Remember, when it comes to maximum life and effectiveness of a lube, you want to keep it clean, cool and dry. With the limited amount of storage space inside plants, it is common to have an outside storage area for new oil drums. This practice creates a high risk for ingression of water into the new oil if the drums are not stored properly. This is especially true during the summer months when the temperature of the drums can be upward of 50 degrees of Celsius. As it rains, water is trapped on top of the barrels, and eventually the bungs are submerged. As a drum heats (through sunlight and ambient temperature) and cools, it actually “breathes.” That is, air is exchanged from the headspace on top of the oil into the atmosphere and vice versa. When water is sitting on top of the bungs during the “inhaling” process, it is pulled into the oil by suction. This can occur in drums that have never been opened. Once the water is in the oil, it begins to settle to the bottom of the drum and raise the fluid level in the drum. As this process continues, more and more water is accumulated at the bottom of the barrel, deforming the barrel and pushing oil out of the bungs. This problem can be mitigated by several inexpensive solutions. When storage of drums outside is unavoidable, the drums should be stored horizontally and covered. There are a number of pallets on the market that make this possible. A necessary step to achieve lubrication excellence is designing a best-practice lubricant storage and dispensing room.